Creating life—“artificial life”—from nonlife is a popular SF theme. But will it remain fictional … or eventually be developed with future biotechnology? The most famous science fiction story about the creation of artificial life, of course, is Mary Shelley’s novel Frankenstein, published in 1818. Strictly speaking, the Frankenstein monster was not wholly artificial life: Victor Frankenstein assembled a body from existing human limbs and organs, and then made this composite being come alive. In his 1922 short story “Herbert West—Reanimator,” H.P. Lovecraft’s mad scientist, Herbert West, started—like Victor Frankenstein—with a body that already existed; he simply brought it back to life. Another intriguing story revolving about artificial life is Ted Sturgeon’s “Microcosmic God” (1941). A scientist creates an artificial life form – a race of miniature beings that rapidly evolves to a level of high intelligence. Greg Bear, in his 1985 novel Blood Music, imagined artificial life on a small scale—specifically, artificial living bacteria. And in the 2009 movie Splice, Adrian Brody creates a new hybrid species of intelligent biped in the laboratory through gene splicing. Earlier, in 1953, two scientists, Harold Urey and Stanley Miller, were the first men to attempt to create life from nonlife. In the Urey/Miller experiment, the goal was to show how life could have arisen from nonlife. A mixture of methane, ammonia, hydrogen, and water—compounds that were plentiful in ancient oceans—was exposed to an electric current, just as those oceans were struck countless times by lightning. The process formed amino acids, the basic building blocks of living organisms. Today scientists continue to work towards the dream that life could be created from nonlife. For instance, Hamilton Smith, a Nobel laureate, has announced plans to create a single-celled, partially man-made organism in a laboratory. If he is successful, his organism will be true artificial life: the cell will feed and divide to create a population of new cells never before seen on Earth. To create this artificial organism, Smith will remove the genetic material from a microscopic organism, and replace it with artificially created chromosomes. A new field, “synthetic biology,” involves scientists redesigning and re-engineering living organisms in a laboratory for specific purposes. Using synthetic biology, you might create an organism that swims through your circulatory system and eats plaque from artery walls, preventing heart disease. In synthetic biology, scientists take an existing organism and alter its DNA in the laboratory. The result: a new type of organism not produced by nature or evolution—a man-made form of life. A number of new life forms have already been created through synthetic biology. One removes heavy metals from wastewater. Another performs simple binary logic—making it useful for biological computing. Jack Szostak, a researcher at Harvard Medical School, is conducting experiments aimed at creating an artificial single-celled organism from chemicals. He has already been successful in creating self-replicating RNA molecules from nucleotides. Steen Rasmussen, a physicist at Los Alamos National Laboratory, is also working on a synthetic life form, nicknamed the “Bug,” which he plans to build from a molecule largely foreign to natural life forms: peptide nucleic acid (PNA). PNA uses the same “letters” of the genetic code as DNA—A, T, C, and G—enabling PNA to self-replicate in a similar fashion to DNA. Created from nonliving chemicals in a laboratory, PNA-based artificial organisms—a new form of life—could be custom-built for specific tasks ranging from breaking down toxic compounds and producing useful chemicals such as hydrogen fuel, to becoming part of machines that can repair themselves like living beings. As we’ve noted elsewhere on this blog, L. Ron Hubbard believed predicting future science and technology was an important element of science fiction. “Science fiction does not come after the fact of a scientific discovery of development,” he wrote. “It is the herald of possibility. It is the plea that someone should work on the future. 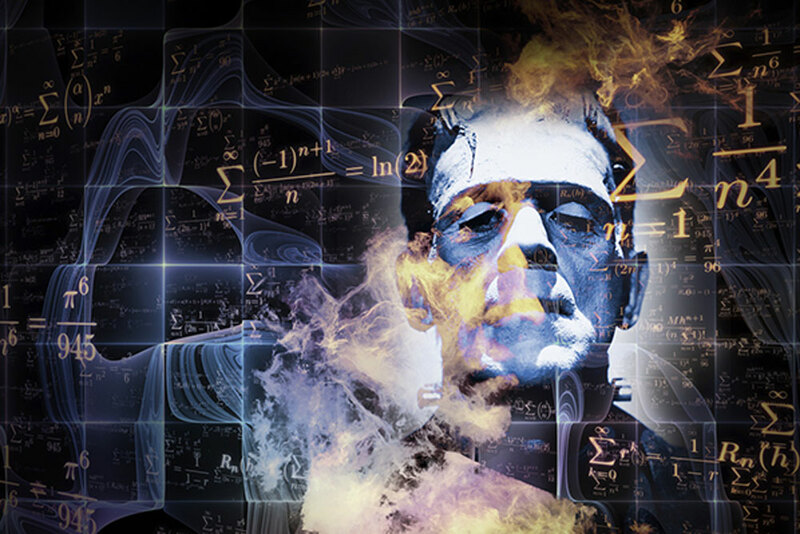 We don’t know with absolute certainty whether any of these scientists read or were influenced by SF—but it’s difficult to imagine anyone not knowing the Frankenstein monster. In the ongoing effort to create artificial life in the laboratory, scientists are making one of L. Ron Hubbard’s central notions in SF—that science fiction both predicts and inspires scientific breakthroughs—come true once again.